From lake-effect snowstorms to cool summertime breezes, the presence of Lake Michigan is constantly felt by Chicagoans while confronting the city’s fluctuating weather conditions. 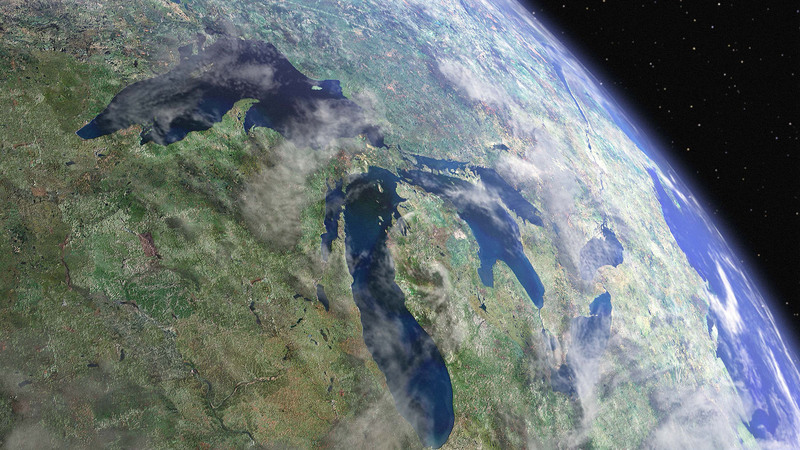 The same goes for the 34 million people who live in the basin defined by the Great Lakes, which account for a fifth of the world’s supply of surface freshwater. Spanning 750 miles from west to east, the Great Lakes are always influencing weather throughout the region. In the summer, for example, their humidity offers cloud cover and precipitation both over the lakes and inland, providing ideal growing conditions for orchards in Michigan’s fruit belt. Document: Read the full report But a new, first-of-its-kind report shows how climate change is threatening the lakes themselves, and how their transformation figures to impact weather, public health, infrastructure, wildlife and the regional economy. Illinois and other Great Lakes states should prepare for more extreme weather events, including flooding earlier in the year and heat waves and drought in the summer months, according to the report, commissioned by the Chicago-based nonprofit Environmental Law & Policy Center and the Chicago Council on Global Affairs. The region can also expect a decrease in overall snow but more lake-effect snowstorms of significant magnitude. Changes to the lakes’ ecosystems will increase the number and severity of algae blooms, resulting in water that is unsafe to drink, according to the report. Increases in lake bacteria could also make water unsafe for swimming. The region’s agriculture will also take a hit, the report states. Changes in seasonal precipitation, which are already causing farmers to delay planting, will cut crop yields for both soybean and corn by a projected 10 to 30 percent by the end of the century. These are just a few of the findings from the new report, which was compiled by more than a dozen scientists and experts from universities in Canada and the Midwest, including Northwestern University and the University of Illinois. The report was commissioned to educate public officials about the impact of climate change on the Great Lakes, and to spur them to action given what advocates say is a lack of urgency to address the issue at the federal level. In the report, researchers also demonstrate how recent extreme weather events – which scientists say are increasing as a result of global warming – have taken a toll on the region. A heat wave and drought in July 2012 caused more than $30 billion in economic damage, 123 deaths and contributed to long-term health impacts across the central and western U.S., according to the report. The comprehensive study was led by Don Wuebbles, a professor of atmospheric science at the University of Illinois and former assistant director of the Office of Science and Technology Policy under former President Barack Obama. ELPC said it plans to share the report with Gov. J.B. Pritzker’s administration and Illinois lawmakers, along with policy recommendations to reduce greenhouse gas emissions and other pollutants that threaten the Great Lakes. The suggestions include investing in renewable energy sources and cleaner modes of public transportation, improving energy efficiency and reducing harmful algae blooms that threaten drinking water, fisheries and recreation. The organization also urges federal officials to restore the $475 million in proposed funding for the Great Lakes Restoration Initiative. To read the full report, visit ELPC’s website.